Ethanol (CH3CH2OH; also known as ethyl alcohol, grain alcohol, and EtOH) is a clear, colorless liquid. Its molecules contain a hydroxyl group (-OH) bonded to a carbon atom. Ethanol is made of the same chemical compound and it is the same renewable biofuel whether it is produced from starch and sugar-based feedstock such as corn grain (as it primarily is in the United States) and sugar cane (as it primarily is in Brazil) or from cellulosic feedstock. Making ethanol from cellulosic feedstock such as grass, wood, crop residues, or old newspapers is more challenging than using starch or sugars. These materials must first be broken down into their component sugars for subsequent fermentation to ethanol in a process called biochemical conversion. Cellulosic feedstock also can be converted into ethanol using heat and chemicals in a process called thermo chemical conversion. Cellulosic conversion processes are a major focus of U.S. Department of Energy research. Ethanol is a renewable, largely domestic transportation fuel. Whether used in low-level blends, such as E10 (10% ethanol, 90% gasoline), or in E85 (85% ethanol, 15% gasoline), ethanol helps reduce imported oil and greenhouse gas emissions. Ethanol works well in internal combustion engines. In fact, Henry Ford and other early automakers thought ethanol would be the world's primary fuel before gasoline became so readily available. A gallon of pure ethanol (E100) contains 34% less energy than a gallon of gasoline. Ethanol is a high-octane fuel. Octane helps prevent engine knocking and is extremely important in engines designed to operate at a higher compression ratio so they generate more power. These engines tend to be found in high-performance vehicles. Low-level blends of ethanol, such as E10 (10% ethanol, 90% gasoline), generally have a higher octane rating than unleaded gasoline. Low-octane gasoline can be blended with 10% ethanol to attain the standard 87 octane requirement. Ethanol is the main component in E85, a high-level blend of 85% ethanol and 15% gasoline. E85, also called flex fuel, is considered an alternative fuel under the Energy Policy Act of 1992 (EPAct). It is used to fuel flexible fuel vehicles (FFVs), which are available in a variety of models from U.S. and foreign automakers. 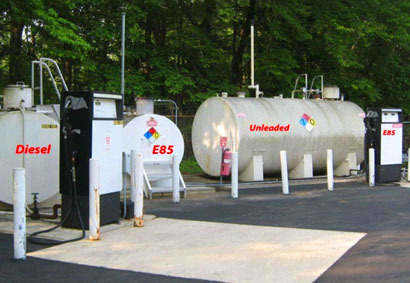 Click here to search for E85 vehicles and E85 station locations. The gasoline content in E85 enables FFVs to operate normally under cold conditions. Fueling a vehicle with pure ethanol (E100) creates problems during cold-weather operation. E85 contains between 51%-83% ethanol depending on time of year and geography. Ethanol can also be mixed with gasoline in lower-level blends, which provide many benefits but are not considered EPAct alternative fuels. Other than lower gas mileage, motorists will see little difference when using E85 versus gasoline. E85 has about 27% less energy per gallon than gasoline (mileage penalty lessens as ethanol content decreases). E85 is typically priced lower than gasoline, so that cost per mile is comparable. Note: Purchaser must be a municipal, state or federal government entity qualified to purchase through North Carolina's State Procurement System.